An unofficial hint book for Zork I, independently published by a company called Witt's End Associates. Their address is given as 42 Morehouse Road, Easton, CT 06612. 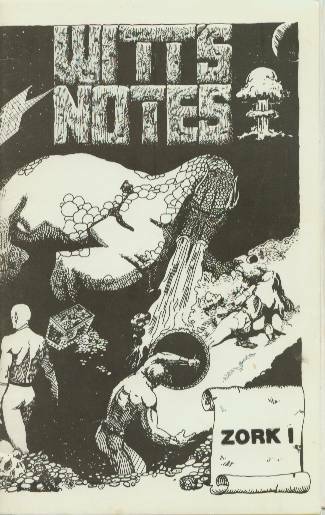 "Witt's Notes" for adventure games, kind of like "Cliff's Notes" for literature. The copyright date is 1984, and the only author credit is "Kyle", from the book's introduction. Witt's was definitely more of a fan shop than a full-blown publisher, most likely an individual or two selling their own hint book to earn a little cash. The cover paper is similar to that on the Infocom InvisiClues booklets, but the inside consists of cheap and often somewhat crooked Xeroxes of typed pages. The hints are encoded with a letter-substitution cipher, and the book includes an Applesoft BASIC program you can type in to decrypt them faster. 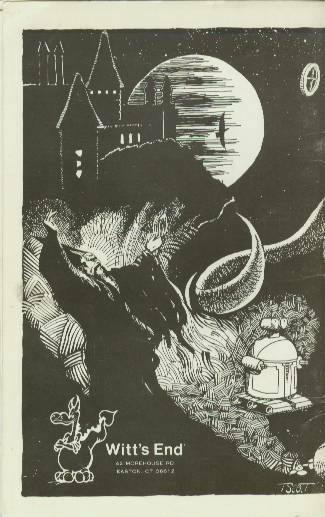 There's also a couple of pages on Infocom and Zork history, a list of fun things to try (not encrypted), and a list of items and treasures (from which the brass bauble is omitted). A set of ruler-drawn maps completes the set.